Now that I have entered menopause, I notice my water requirements are escalating. How do I know? My body tells me so. I also notice since I started working with a personal trainer that I am naturally more thirsty. I now look forward to drinking water. I am more relaxed, I sleep better, I am more energetic, happier, eat less (especially snacking), my skin looks better, less colds and flu, to name just a few of the benefits of drinking water. All this talk about water is making me thirsty. MUST READ: You’re Not Sick you Are Thirsty by F. Batmanghelidj, M.D. I would highly recommend reading this book if you have ever baulked at drinking 8 glasses of water per day. Upon first glance it may seem unremarkable. However, as you get deeper into this book it is chalk full of facts revealing the importance of proper hydration. 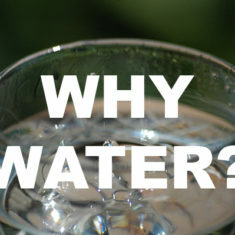 The information is so detailed that you will never go back to “forgetting to drink your water”. The author goes further into the dangers of not drinking enough water, how caffeine can cause even more hydration problems. Amazing scientific facts are revealed related to disease and disorders in the body, including, asthma, allergies, heartburn, high blood pressure, heart attack, stroke, cancer and more. If you’ve ever suffered from any of the above ailments or any ailments for that matter, this book is essential reading. As a bioenergetic technician part of my recommended regimen is to send clients home with the very formula the author describes on how much water to drink on a daily basis based on how much your body needs to function smoothly. I wonder how much of my success with clients is related to practicing adequate hydration. One more observation after reading this book, my husband is addicted to caffeine. After reading this book, I made it a goal to put water in front of my husband continuously, in spite of the caffeine consumption. Wow, what a poignant experiment. He drank a bit less caffeine. Then I noticed within 24 hours that he was literally lighter, funnier, wittier, more awake and alive than I had seen him in a long time. We actually had fun instead of watching him rest because of a strenuous work week. Of course, you can only hydrate yourself. Enjoy water for it truly is the best medicine. Bio Energetic Technician, Emotional Release Expert and International Holistic Lifestyle and Wellness Coach. I've been practicing since 2001. I serve women struggling with over doing, over giving and over thinking and subsequent low energy, emotional eating and chronic health issues as a result.